You do not need a loan at credit card rates of interest to fund your business growth! Travelling to work, I heard the ad for an online lender to SME’s. The ad, literally, promised “stress free repayments”. It also spruiked using its loans to pay to hire staff or buy stock. This may be well and good for some businesses, but shouldn’t you be making a profit first and using these profits to reinvest in your business and hire the staff or buy the stock? It is a myth that you need high-interest loans to fund your business. One of my clients took out a loan with said financing company and was nearly crippled due to the distinctly non-stressful daily repayments and massive interest rates. It’s taken a Herculean effort to repay this lender. 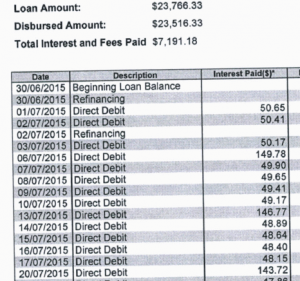 Check out the loan statement and the interest paid below. This interest was for a loan period of less than seven months! Pay your profit first, reinvest in your business, steer clear of loans with credit-card like interest and join the debt-free-business tribe.